Then experience opera like you’ve never seen before, as they take the stage with in a fast-paced comical farce in an adaptation of a much loved score. The show has razor-sharp timing as barber, Figaro, tries to help the young Count Almaviva win the hand of the beautiful Rosina, out of love rather than for his wealth. Soon the pair set about to produce many disguises for Count Almaviva, and thus the farce ensues! Rossini’s famous opera buffa is brought to life by the critically acclaimed Pop-Up Opera, sung in Italian with English captions. Running time 2 hours 10 minutes plus interval. To find out about their latest upcoming shows and to make a booking click here. 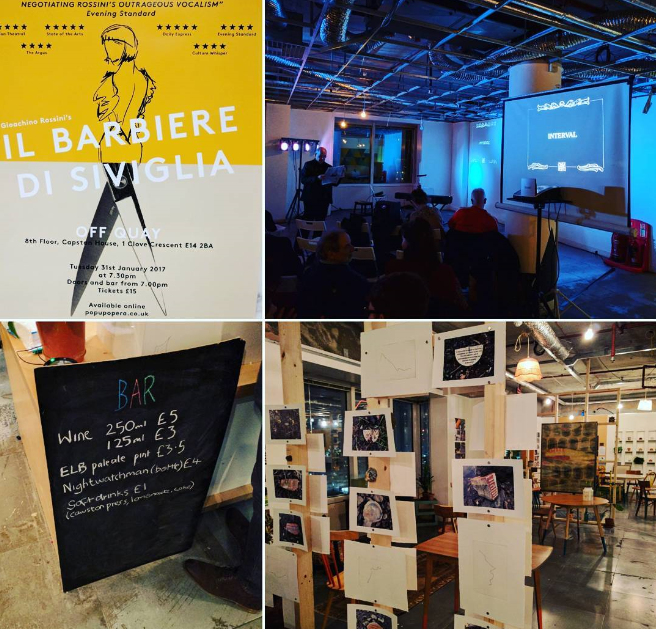 My visit in the opening night of The Barber of Seville at Off Quay, East London! When arriving to an unused office space up a lift on the 8th floor, you don’t expect to find much excitement. But, this is where Pop Up Opera is, showing their rendition of the Barber of Seville. The space is bare bones: foldout chairs, open un-finished ceiling, white walls and that’s it. Besides the lovely bar area which had seats and art for sale, you’d never know the treat about to arrive. Personally, I’m not usually a huge opera fan, I get distracted and bored. This show though found a way to even keep me entertained. The actors worked their way around the crowd, keeping us guessing who was coming and who was going. They threw things around, shot water guns, and generally kept us entertained in an expected way. Being an Italian opera, some knowledge of the language comes in handy. For those who don’t have that, there were translation screens which explained the situations in modern and fun ways. This show was so up to date that even ‘alternative facts’ was used to describe a scene which got laughs and applause. The creators of this show were on the ball and it was clear they put a lot of work into the performance. This was also seen with the creativity of the costumes, which were also perfect for the roles they were playing. If you can catch this show before it’s run is over, you’ll be well impressed. The opera is set in Seville (Siviglia) Spain, and the story is about a barber called Figaro (Tom Stoddart) who assists Count Almaviva (Ciaran O’Leary) – a celebrity in love with the beautiful Rosina (Katie Slater). Almaviva does not want Rosina to know of his status and riches so pretends his name is Lindoro, and disguises himself as a poor student. So far, pretty simple-ish? Well now it gets somewhat bizarre, as Rosina also has a guardian (James Schouten), who plans to marry the young Rosina himself… Bit weird. And there’s also a creepy music teacher (Steven East) and a housekeeper (Emily Blanch) that helps move the story along.